This working conference aims to address issues related to migrant and refugee inclusion policies and practices with a strong focus on local level perspectives bringing together researchers, policy makers, non-governmental sector representatives, as well as migrants and refugees. 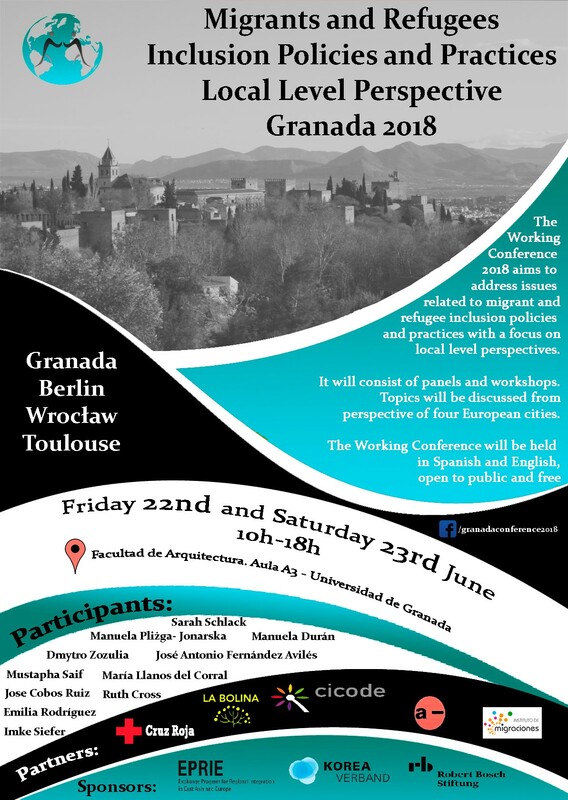 The challenges faced by all these actors in shaping and implementing inclusion policies and practices will be discussed from the perspective of four European cities: Berlin, Granada, Toulouse, and Wrocław. 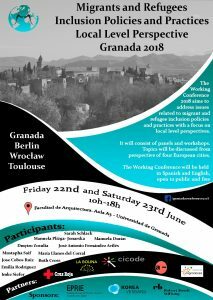 Granada, as the venue, also symbolize the spirit of this conference. As one of the most prominent places of migration into Europe, it marks both a historical and contemporary perspective of migration. In particular, the symbol of the Alhambra, one of the most well-known UNESCO World Heritage Sites, stands for the historical and cultural significance of migrating people to Europe and their settling in new places. Within this symbolic place, we would like to link to current political debates, e.g. to what extent Islam belongs to the past of a European country. With the historical significance of this place, we would like to address current local migration processes. With millions of tourists visiting the city of Granada every year, the many activities that take place in the background are often not noticed. The juxtaposition of historical and contemporary migration processes becomes particularly tangible in Granada. Especially in cooperation with local migration organizations, we want to give this interaction space and draw attention to the parallels of past and present. In addition, three other cities will bethe focus of this conference. As an example of current migratory movements to Europe, experts from Berlin, Toulouse, and Wrocław will provide insights into their work with migrants and refugees. Although migration policies are heavily influenced by national legislation, this conference aims at highlighting the importance of local level actors in the process of migrants and refugees inclusion. The above-mentioned cities have been selected because of either their historical role in migration processes to and within Europe or the current significance in public discourse relating to migration and inclusion. Each of these cities represents different migration patterns to and within Europe as well as different inclusion strategies. Therefore we believe that this particular collaboration will result in an interesting and insightful exchange of knowledge and practices which could form a set of recommendations for policy makers and activists both on the local level in the chosen cities and beyond as well as stimulate further civil society actors’ involvement. The conference is free and open to the public. Registration in advance is not necessary. In addition to lectures, discussions and interactive workshops will take place. There will also be a poster session where local initiatives can present their work. If you would like to introduce your organization at the conference, please write an e-mail to conference.office2018@gmail.com or martakanarkiewicz@gmail.com. An exact program will follow soon. The conference takes place on Friday 22nd of June between 10am and 6pm as well as on Saturday 23rd of June between 10am and 3pm. For further information please visit the Facebook page of the conference. The conference is organized by Marta KANARKIEWICZ (University of Wrocław, Wrocław, Poland), Albert DENK (Ludwig-Maximilians-Universität München, Germany), and Selma POLOVINA (Airbus Group, Bosch Alumni Network; European Movement Haute-Garonne/Ariège, France). The project is funded by the EPRIE Project Fund (EPF) by Korea Verband and Robert Bosch Foundation.